Gurgaon: Unique medical case captured global attention last week, in which doctors came across a rare condition in which a 3 year old girl Ahana Afzal from Hyderabad was bleeding from nose, mouth, eyes and private area along with intermittent hypertension. Baby Ahana started bleeding from her nose 16 months ago, which was followed by blood from her mouth, ears, eyes, and even private parts. Doctors who are currently supervising Ahana’s treatment suspects that she could be suffering from a rare medical condition called Hematidrosis ( blood in sweat ) and Hemolacria ( blood in tears ). While the father of the Baby Ahana, Mohammed Afzal desperately seeks help from the Chief Minister and Prime Minister for his daughter’s treatment, Artemis Hospital (JCI & NABH accredited) in Gurgaon (Delhi-NCR) has volunteered to treat Baby Ahana for free. Artemis Hospitals under the aegis of Dr. Shashidhar TB- Head, ENT has made phenomenal headway in treating Hemolacria and Hematidrosis spectrum, a rare infirmity seven times over at their hospital. A rare condition which not many hospitals have been able to treat permanently so far. Apparently more than 5 cases have been completely cured and 2 cases are under treatment and have shown dramatic improvement. Artemis Hospitals have already approached the family and given them their statistical success in the above case. So far the child has undergone multiple transfusions and periodic hospital admission to keep the condition at bay. The treatment has been administered without any permanent solution as yet. 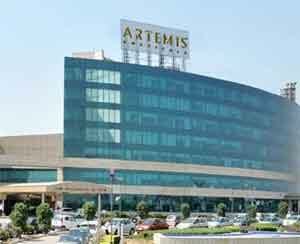 We just pray for this baby & all the best Artemis Hospital.